To give the tart a nice mediterranean touch I flavoured it with ground hazelnuts, different citrus fruits and other slightly more exotic fruits. My personal tip: Herbaria's Sweet Geisha organic spice mixture, which consists of raw cane sugar, pineapple flakes, passion fruit flakes, banana flakes, mango flakes, vanilla, lemon myrtle, matcha green tea and ginger and lends the tart a really sunny and exotic flavour. However if you can't get your hands on that, just add a little more lemon and orange peel. 1. Bring milk and rice to the boil. Reduce the heat slightly and let simmer for about 30 minutes until the rice is almost cooked and the milk almost fully absorbed, stirring constantly. 2. Preheat the oven to 150°C (302°F). Stir the sugar, "Sweet Geisha" spices, lemon and orange zest and a pinch of salt into the rice mixture. Allow to cool for about 10 minutes, then add the eggs one at a time, stirring well after each addition. Add the butter and beat until it is completely molten. Stirr in the ground hazelnuts and the flour. 3. Grease a tart pan with butter and dust with 2 tbsp of flour, removing the excess flour. Pour in the rice mixture and smoothen the surface. Bake at 150°C (302°F) for about 60 minutes or until an inserted toothstick will come out clean. 4. Let cool completely. 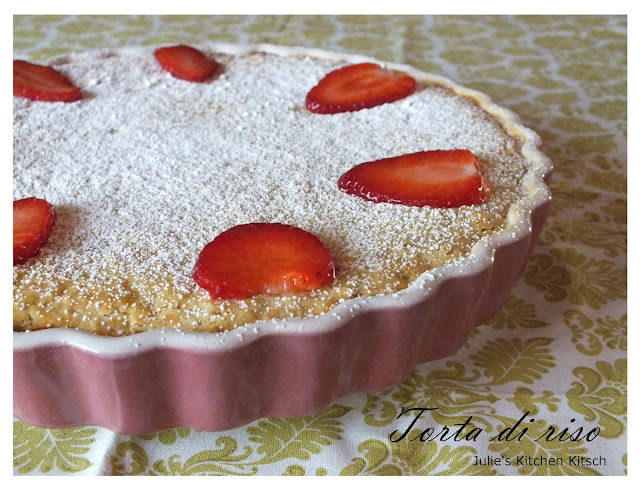 Dust with icing sugar and add thin slices of 3 or 4 strawberries to decorate the tart if you like.